Thanks to the equine health practices that Muldoon already had in place at his facility and the quick action of the Maryland Department of Agriculture, the single case of EIA was contained and did not spread to any other horses. The big question still remains… how did this happen in the first place? The Equiery sat down with Muldoon to talk about the case, and many other things related to MDA-imposed hold orders. Early in the summer, a new mare arrived at Summerhill Polo in Poolesville for training. The mare had a current Coggins that was negative. Muldoon has a farm policy however, that requires all horses to have Coggins tests for the year in which they are competing. Thus, even though the mare had a negative Coggins from 2017 that was still “good” by U.S. standards, he requested a new Coggins be drawn. His veterinarian drew blood for the new Coggins test and the results came back as a very slight positive. At this point, the veterinarian took a second sample to make sure the first was not a false positive. Muldoon said it was this second test that confirmed positive for EIA. Because there is no cure for EIA, the mare was euthanized. “It is a good thing we drew the new Coggins when we did or there may have been time for it to have spread to other horses,” Muldoon added. “This is no one’s fault. We did everything right and it just happened.” Of course, he said, “The owner was devastated and very depressed over the whole situation. This was the horse that was going to take him to the next level of play.” It should be noted that the mare never showed any symptoms of EIA. Muldoon spent most of the summer researching EIA and has his own theory of how the mare caught the disease. “I think that she may have had it for a while but like so many other diseases, her titer had been going up and down and just happened to be down when her last Coggins was drawn,” Muldoon explained. It is just a theory but could also explain why the first Coggins drawn in July of this year showed up as a very low positive. To keep his clients and their horses going, Muldoon organized scrimmages and matches between the players at the farm and even brought in some pros to do matches on the horses at the farm. “It is a hard balancing act to keep the clients happy and still run a business while not being able to ship out of the farm,” Muldoon stated. He did end up having to cancel all of their local matches and told his European clients to stay home for the summer. “It was a financial disaster but it was our responsibility to make sure it didn’t spread elsewhere,” he said. After the hold order was lifted, it was back to business as usual at Summerhill Polo. “It is really frustrating to not have any real conclusion as to where this mare got it from in the first place and I guess we never will know, but we all learned a lot along the way,” Muldoon said. He later commented that he is curious about if there are other diseases that have developed that are similar to EIA, and if there are people still researching the disease. “The Coggins test itself is so old, it just makes me wonder,” he said. After going through this ordeal, Muldoon’s biggest suggestion for other farm owners is that they insist on Coggins being taken every six months instead of annually. “People are traveling way more often than they used to and it is our responsibility to protect each other’s horses,” he said. He added that he plans to ask for a new Coggins and a health certificate to be done prior to the arrival of any new horses to his facility. Spending a little extra money for those tests up front can save thousands in the future. Muldoon also suggested that if after all the precautions one can do, a horse on your property tests positive for a reportable disease and a hold order is in place, “Keep the lines of communication with your clients open. Saying ‘I don’t know’ is the worst thing you can tell them.” Muldoon had MDA veterinarians speak to his clients directly to explain the situation and answer questions. “That was very helpful and put the clients’ minds at ease a bit,” he added. As news of a Montgomery County horse testing positive for EIA circulated the internet, a lot of Equiery readers started posting questions as to what the virus is, how a horse becomes infected and how they may or may not be treated. 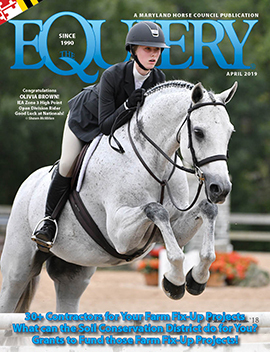 The Equiery hopes we are able to answer a few of your questions here. Equine Infectious Anemia (EIA) is a blood-borne virus, typically transferred by biting flies or infected needles that affects horses, donkeys and mules. EIA is closely related to the human immunodeficiency virus (HIV), but is not known to affect human health. The disease is characterized by fever, anemia, jaundice, depression, edema and chronic weight loss. However, EIA is often difficult to differentiate from other fever-producing diseases. Categorized as a retrovirus, “EIA contains genetic RNA material which it uses to produce DNA. This DNA is then incorporated into the genetic makeup of the infected cells,” according to the United States Department of Agriculture. The clinical symptoms are a result of inflammatory and immune responses to the virus, where the horse’s system continuously produces antibodies that will never successfully eliminate the virus. Instead, they unintentionally attack the cells with viral particles attached, which cause damage to the kidneys, liver, spleen, lymph nodes, bone marrow and brain. According to the MDA Public Health Office, the virus can take on three stages. The “carrier” phase is a horse that has low levels of the virus in its system but can still transmit the virus. These horses, as in the Montgomery County case, may not show any symptoms. A horse in the “chronic” phase will look thin and unhealthy and will spike a fever. The “acute” phase is fatal. Unfortunately, there is no successful way to treat EIA and there is no vaccination against it. For horses that are infected and survive the virus, the only options are a lifetime of quarantine or euthanasia. According to USDA, only one horse fly out of six million is likely to pick up and transmit EIA from carrier horses. Insect transmission of EIA is dependent on the number of insects, the density of the horse population, the number of time the insect bites the same and other horses, the amount of blood transferred between horses and the level of virus obtained in the blood meal. The Coggins is a blood test that detects antibodies to EIA showing either a negative or positive test result. While there is a misconception that the purpose of a Coggins is simply to ensure your horse is free to travel, it is a most important screening to ensure your horse’s health status and avoid the spread of EIA. The Coggins Test was developed by Dr. Leroy Coggins in 1970. Dr. Coggins was the first head of the Department of Microbology, Pathology and Parasitology at North Carolina State University School of Veterinary Medicine where he earned a BS in Dairy Sciences in 1955. He earned his DVM from Oklahoma State University in 1957 and a PhD in Virology from Cornell University in 1962. While in Kenya, Dr. Coggins was researching African Swine Fever. When he returned to Cornell, he applied this research to Equine Infectious Anemia. The test he developed, which was then named after him, detects the virus within two days of taking a blood sample. The test was officially approved by the USDA in 1973. 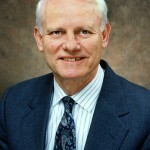 Dr. Coggins retired from NCSU in 1994 and died at the age of 81 in 2013.